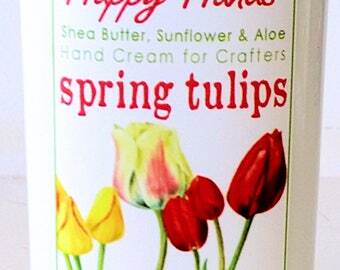 Announcement I hand-craft my Happy Hands shea butter hand cream for knitters, fiber artists & crafters who need a non-greasy moisturizing cream that will *not* transfer to your handiwork! I've created 32 different fragrances, plus Unscented, in 1, 2, 4 and 8-ounce bottles. And I offer a variety of Sampler Sets to help you choose your favorite Happy Hands scent. DIY indoor garden kits to grow your own fresh, organic microgreens. Packed with nutrients, microgreens grow from seed to salad in 7 days! Art-to-wear clothing: denim jeans, jackets, vests ... because life's too short to wear boring clothes! I hand-craft my Happy Hands shea butter hand cream for knitters, fiber artists & crafters who need a non-greasy moisturizing cream that will *not* transfer to your handiwork! I'm so glad that I chose the sampler pack to begin with. The scents are amazing and the cream really does absorb quickly and thoroughly. I shared one with a friend and she's sold on it as well. I will definitely be back to purchase more in the future! I must confess I am not a knitter or yarn artist, but I was drawn to this lotion because I HATE sticky lotions and lotions that leave residue. I'm honestly amazed by how great this absorbs into my skin and how there's no residual "icky" feeling but my hands smell amazing and are instantly softer. I really regret not knowing knitter's lotion was a thing earlier on but now that I know, I'll never go back. My samples as well as purchased scent smell amazing. I will definitely order more when this bottle runs out. Some of you under the Polar Vortex are craving Vitamin C, I've had 6 orders in a row for my Grapefruit Tangerine hand cream! Fun fact: the grapefruit & tangerine essential oils I use are especially good for healing dry cuticles. Stay warm, my friends! Another new label design - Mulled Cranberry! Love this seasonal scent, like Christmas in a bottle - bright tangy cranberries with holiday spices. Fresh label designs for my Happy Hands hand cream! Here's the new look for my Peppermint Candy hand cream - (one of the most cheerful fragrances I know) - sweetly energizing and a little bit tingly, just the thing to brighten up a winter day! My all-time bestselling scent: Sandia Sage and Lavender. Happy Hands by the tottle-full! The view from my studio window, aah. How I heat seal sample packets. Up here in the high mountain desert of New Mexico, dry hands are a year-round problem. I needed a creamy lotion that would deeply moisturize & soften my hands, but absorb quickly and NOT leave a greasy residue on my hands that would transfer to my knitting. And of course, it had to smell wonderful! Because my cream base absorbs quickly into your skin, you can enjoy the long-lasting fragrance, but the scent will NOT transfer to your fiber or craft handiwork. ♥ Shea butter is made from the nut of the African karité tree, called "women's gold" because of the vital income its harvest provides the women of Africa. Shea butter is an excellent natural moisturizer and therapeutic emollient, with Vitamins A & E helping to heal dry, cracked and damaged skin. ♥ Sunflower oil is pressed from black sunflower seeds, a natural emollient also high in Vitamin E that helps retain moisture in the skin. ♥ The juice of the succulent Aloe Vera plant has been used for centuries to rejuvenate, heal & soothe skin. ♥ My Happy Hands formula contains NO parabens, NO mineral oil, and NO coloring agents of any kind. ♥ I use only natural essential oils and pure cosmetic-grade fragrance oils (all phthalate-free) to create my scents. ♥ I bottle my hand cream in crystal-clear, BPA-free bottles. I'm a retired archaeologist, graphic designer, avid knitter, locavore and pet rescuer, living high & dry in the Sandia Mountains of New Mexico. Welcome to my Happy Hands Store! Here you'll find my hand-blended shea butter hand cream, in 32 scents plus Unscented. I offer free shipping on all USA orders, and discounted International shipping too, no minimum purchase required. I'm always happy to save you postage by combining orders!